As a lawyer, my time is a scarce resource. I’ve designed an all-in-one system that beats any productivity app. Since notebooks have always been around for as long we can remember, we tend to take them for granted. Their appeal — especially when compared to digital tools like Trello, Todoist, and Evernote — is, to put it lightly, lackluster. In the past, I’ve found they rarely spark creativity. They’ve felt functional, uniform, and mandatory. The coils eventually unwound. Markers bled through the thin paper. Everything was unsatisfactory to the eye and to the touch. Goodbye paper, hello laptop. 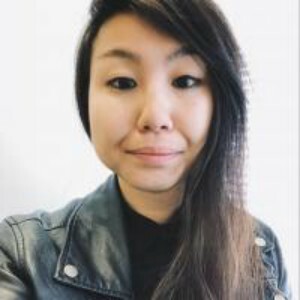 Recently, though, I found myself playing with different digital tools in the hopes of finding a workflow I could commit to, something that would help me stay on top of both my personal life and my work as a lawyer. Once again, everything was unsatisfactory. Trello didn’t match how I broke down my work. Todoist was too much to keep up with, and Evernote failed to wow me. Exasperated, I returned to my old system of using 4×6 index cards to write down my daily tasks, symbolically ripping up each one at the end of my workday. But I didn’t just want a space to record my tasks; I wanted a full-fledged operating system where I could capture ideas, organize my work in a way that made sense to me, track my personal habits, and create my monthly budgets. In other words, I wanted a one-stop shop. The point isn’t to be an Energizer Bunny. It’s to know, on a fundamental level, how you’re spending your time. Now, I’m hooked: I use the Bullet Journal method to plan my workday, create monthly budgets, and track my personal habits (health, gratitude, reading list) all in a single notebook. Let me show you how my analog operation system works, and how I’ve adapted Carroll’s template to meet my daily needs. For me, a good week involves eight or more hours of deep work, which is ample time to complete my most mentally straining tasks, like writing submissions, sifting through and summarizing evidence, preparing a client for a hearing, or conducting legal research. I do this all within the confines of a normal 40-hour workweek, with the exception of the weekend before a hearing. In my Bullet Journal, I use the daily log only for tasks that are non-work related. On the right side of the spread, I sketch a rough schedule for my day. I decide which work-related tasks I’ll be tackling after running through a Word document I call my Master Task List, or MTL, that’s saved on my work computer. The MTL has a list of all my clients, with their names acting as separate headers; under each header name, I track when I last worked on their file, what steps I’ve taken, and what work remains. When I finish the task, I strike it through and type the next task below the last. It’s essentially a running tally of the work I’ve done, the work I have left to do, and how much time has elapsed since I’ve looked at it. At the start of each week, I determine the tasks I need to complete over the next five days. I then organize my tasks into three levels: third-level tasks take less than half an hour to complete, second-level tasks take less than an hour, and first-level tasks take more than an hour. Next, like assembling pieces of a puzzle, I compare this list of tasks to any meetings I have that week and figure out when I can schedule deep work. During my deep work blocks, I only assign one first-level task. These tasks are my most mentally demanding and I need lots of uninterrupted time to tackle them. I also schedule an hour or so each day, usually divided into two chunks, where I attack a batch of third-level tasks. If I have a day where I won’t have a large enough block to work on a first-level task, I’ll try to complete one or two second-level tasks. It all depends on the constraints of my schedule. Although my MTL is a word document on my office computer, my weekly task list is handwritten, as is my daily schedule. Once I scroll through my MTL, I can figure out my entire weekly plan offline. I love that: For a lawyer, it helps with maintaining confidentiality (my clients’ names are only on my MTL, which is on a computer that has some insane security system), and I can tweak my work routine at any time simply by opening my notebook. The more I single-task, the more I hone my ability to focus. On the last weekend of every month, I make a date with myself. I sit down with a cup of coffee, review my financial situation, and begin to craft next month’s budget. For the longest time, my budget was in a basic Microsoft Excel spreadsheet, and I would track my daily spending by category in either the Notes App when I had an iPhone, or with Google Notes after I switched to Android. The problem, however, was that I never knew how much money I actually had available to spend in each category, because figuring it out would require me to open Excel and add up all the figures, something I couldn’t exactly do on the fly. Budget apps don’t work for me — I overwhelmingly use my debit card for daily purchases instead of my credit cards. This is where I’ve found my Bullet Journal system to come in handy. As you can see in this photo, my budget is on the left and my spending log is on the right. I record every purchase, its cost, form of payment, which spending category it falls under, and, finally, the remaining balance of that category. In the morning I simply open my notebook and review the right-hand column in my spending log so I’m aware of how much I have left for the rest of the month. Tracking personal habits is a new activity for me. 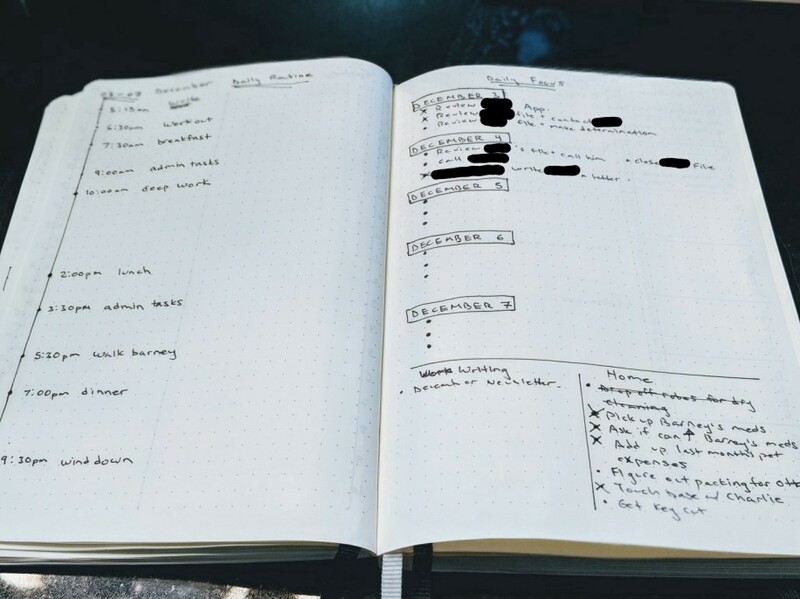 I’d be lying if I said I manage to keep up with updating my various habit logs every single day, but overall the Bullet Journal has done a much better job than any other tool I’ve used to keep me mindful about my diet, fitness, and spending. With my weekly food log, I track what I eat for breakfast, lunch, dinner, and snacks. On Sunday or Monday, in an effort to reduce how much take-out I consume, I’ll plan my lunches and dinners for most of the week (my weekends are a free-for-all). It’s not rocket science, but the simple step of taking 10 minutes out of my day to search for simple recipes online and assigning them to a given day has reduced the amount of money I spend on take-out by at least 80 percent. If this seems daunting to you, rest assured that by Wednesday I start to lose steam and the desire to cook dwindles. But because recipes tend to be for more than one person, I end up having lots of leftovers to eat towards the end of the week. So, although I plan my meals, I really end up cooking on Monday through Wednesday, eat leftovers on Thursday and Friday, and then order in or eat out on the weekend. In keeping with the health theme, I also use the monthly log to track how often I exercise. Ryder shows how he does this in this video at around the 1:10 mark. And buying take-out coffee is another guilty pleasure of mine, so I track this in the monthly log beside my exercise tracker. Each day I don’t buy coffee, I draw an X. As you can see from the video, the Xs add up, sustaining the momentum. A handful of processes within the Bullet Journal method don’t adapt well to my work as a lawyer or a writer. The biggest one is the Daily Log. It’s simply untenable to log work tasks as I move through my day. The fact that I have meetings, impromptu visits from clients, and god knows what else means that the first thing I do when I arrive at the office is sketch out a schedule for the workday. Then, I work. Using my MTL and weekly task list, I sketch out my daily work schedule without fail in my Bullet Journal and adjust accordingly whenever something unexpected comes out. The point isn’t to be an Energizer Bunny. It’s to know, on a fundamental level, how you’re spending your time. The Bullet Journal’s future log also doesn’t adapt well to how I plan or think about the future. The only events recorded in mine are upcoming vacations, but I really don’t even turn to it. Maybe at some point I’ll find a use for this component, but I’m not going to invent a problem just to use an existing solution. Overall, though, I’ve found the Bullet Journal method to be a powerful tool for professionals who want a simple, but customizable, system to organize their life. Once you adapt the system to your needs, the benefits are immediately apparent. There is no finish line, just continuous improvement. For one thing, it’s inexpensive to start. You don’t need the official Bullet Journal. You only need a pen and paper. It’s also low maintenance. Once you’ve created your collections, recording tasks in them becomes quick and automatic, and even enjoyable. I now look forward to opening my notebook and engaging in the process of writing down all the ideas, thoughts, and worries that are floating around in my mind. What’s more, research has shown that writing notes, as opposed to typing them, helps foster recall and improves your ability to understand. Your brain interprets the simplicity of note-taking as a reliable and noteworthy method of recollection. It’s an iterative process. If one spread or module doesn’t work out, you simply turn the page (literally) and start over. You can’t do that if an app’s structure isn’t conducive to how you record or remember information. When I first started bullet journaling, I experimented with a few daily log and monthly budget layouts. If something didn’t stick, it wasn’t a big deal. Different layouts work for different people, so experimentation is important. And lastly, the process is more important than your results: Sure, lots of bullet journalers use the system as a way to achieve specific goals, but at heart, it’s a process. For example, I write down three things that I’m grateful for each morning for no other reason than to cultivate a sense of contentment for what I already have. I track my diet not because I want to lose a certain amount of weight, but because I want to eat more mindfully and healthfully. There is no finish line, just continuous improvement.